This fall, I'm participating in two preschool coops, one for two-year-old Maxwell and another for four-year-old Aaron. With the two of them being only 19 months apart, you would think I could maybe have them both in the same one, but there is a world of difference between two and four. Where Aaron can already read, the only letter Max consistently recognizes is M, so the focus of each group is very different. It was my turn to teach this week, and I have to say, I am having so much fun planning these little lessons. The internet is a wealth of good ideas, so the only hard part is deciding which ones to choose. The letter of the week was D, and so we did a lot with dogs and dinosaurs. 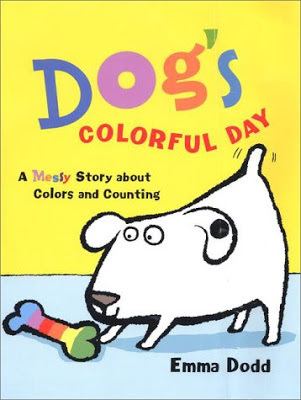 Since dogs were part of the theme for the day, I used Dog's Colorful Day by Emma Dodd for inspiration. In this book, Dog goes about his day and acquires nine different spots from various activities (a pink spot from a drip of ice cream, a green spot from rolling in the grass, etc.). This is a great book because it's so simple (both the text and the illustrations), but it offers so many possibilities for things to discuss: colors, numbers, and counting, as well as the roaming and friendly natures of dogs. It also provides memory opportunities for children: can they remember where he got his blue spot? or his yellow one? So I decided to turn the book into a flannel board story. First, I copied a picture of Dog (and blessed Emma Dodd for her simple, two-dimensional drawings...) and cut out colored spots in various sizes. Then I got all of the pieces laminated. (Have I mentioned how much I want my own laminator for Christmas? Mike, I hope you're reading this.) Then I put velcro on Dog and the spots so the spots could be easily taken on and off. I also drew a bathtub for Dog so he could get all clean, and then I covered the backs of Dog and the tub with felt so they would stick to the flannel. And ta-da! Dog's Colorful Day, flannel-board style. I was a little too proud of this project and had to practice a couple of times with Aaron and Maxwell just because it was so fun to use all the pieces. The whole thing was a big success with the kids this morning. First I read them the actual book so they could get acquainted with the story. Then I gave them each a couple of spots, and they got to put them on Dog as I re-told the story (and Aaron got mad at me because I got a few of them out of order). They helped me count them all and also tried to remember where Dog got each one. Practiced writing the letter D with window markers. Learned about the number 4 and did two different dinosaur poems/songs to count up to four and down from four. I used the flannel board for this one, too. Went "digging" for dinosaur bones in the backyard. Mike used a laser at school to cut out this super cool T-Rex skeleton for me. I just hid the pieces around the yard...there wasn't any actual digging involved...and then we put the whole thing together. The whole thing was cut out of cardboard, and my one regret is that the tail got cut the wrong way so the ugly side faces out. Bummer. Glued shapes onto paper to make their own dinosaurs. For a snack, we ate Chex puppy chow. They pretended it really was puppy chow and that they were dogs eating it (hope that doesn't come back to bite anyone!). It was a really fun morning, and I am really enjoying spending time with these sweet kids and watching them learn. How cute, I would also love to have my own flannel board! :) Thanks for linking up to The Children's Bookshelf. Cute ideas! We love this book!